Yes, we in the Midwest U.S. are looking forward to the lifting of this long cold winter. In anticipation of spring, I am posting a photograph of beautiful daffodils that will be blooming soon. In spite of a cold start to March 2019, the Journal of Advances in Atmospheric Sciences reports that 2018 was the hottest year on record for the oceans. They state that this warming is due to human activity. Of course, warming oceans mean shrinking polar ice, rising sea levels, and coastal flooding. Daffodils will be blooming soon. 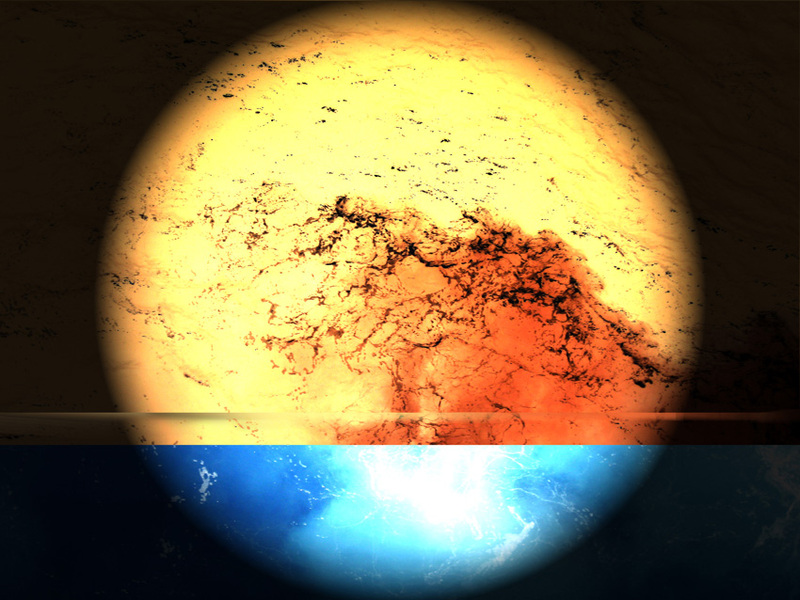 Temperature Rising (top) is a visual commentary on global warming. 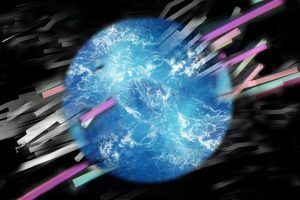 I wrote in a blog for Artists and Climate Change that for me, “this image became an amalgamation of earth and sun, with the sun clearly encroaching on the available space. I started with a photograph of waves in the cobalt-blue Gulf of Mexico. With a photo-manipulation program, I inverted the ocean, and it stunningly became a bright yellow-gold. Inversion is the equivalent to reversing a color photograph to that of a negative. I found it interesting that the yellow-orange area bears some resemblance to sunspots and the bright areas (faculae) that surround them. 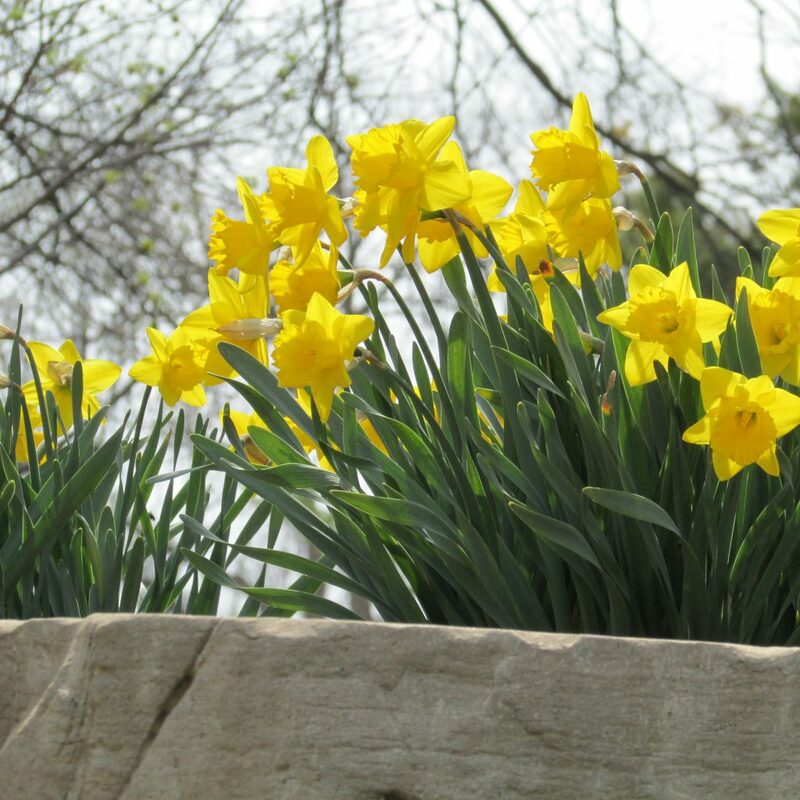 Getting back to our weariness of winter, when the daffodils do bloom, I hope you enjoy them. I know I will. Who doesn’t appreciate the beauty of flowers? Their bright colors and enchanting scents attract insects and humans alike. The curving lines and multiple patterns of flowers invite me to utilize them as subject matter for my art. Why then, for this new art print, have I borrowed the title of Pete Seeger’s enduring anti-war anthem, Where have all the Flowers Gone? In an ironic twist, the meaning for my art is different, but no less dire. 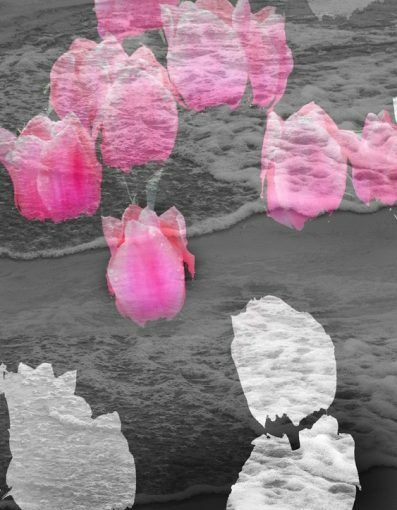 Instead of all the flowers finally going to graveyards, my collage portrays tulips fading and being swallowed by the ocean. It also incorporates a severe color palette of pink, black and gray. Therefore, it asks the question, what will happen to the flowers, fields, and coastal cities as the sea rises to claims them? I am delighted to be part of the 9th Annual Environmental Photography Exhibition, held in conjunction with the 2018 Colorado Environmental Film Festival in Golden, Colorado. It is a worldwide curated photography exhibition. Like the Film Festival itself, the Photography Exhibition hopes to represent the shared visions of world communities that are concerned about environmental issues. I hope you are enjoying the lake or ocean beach this summer. 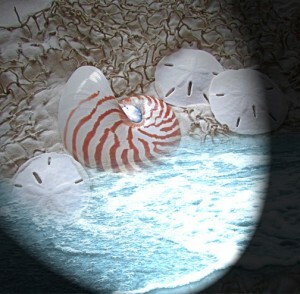 Because it’s summer, I am posting the peaceful and softly colored image Nautilus Beach, pictured above. Even if you are not at the beach, I hope this image will take you there on a visual journey. In spite of this reality, I intend to enjoy and celebrate our rivers, lakes and oceans. I will fight for their health as well. What sparked your initial interest in creating art? I have been drawing and making things since I was young child. Luckily, I had parents that encouraged my creativity. 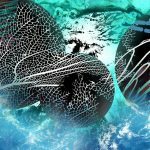 For each art print, I blend my own painting and photography into a digital collage. In my current series, an imaginary beach is populated by starfish, sand dollars, sea urchins and seashells. In this invented world, vivid color drawn from my acrylic painting and resembling the northern lights, flows across these sea creatures. Early in my college art education, I attended a large exhibit of the paper cut-out collages of French artist, Henri Matisse. I was struck by the bright color, movement and fanciful composition of his dancers, leaves and sea creatures. I also very much appreciate the close-up, stylized interpretations of nature by painter Georgia O’Keeffe. What are your opinions on the Evanston/Chicago art community? How do you see your work in relation to this community? The Evanston/Chicago art community is vibrant and varied. Additionally, I experience the Evanston art community in particular as friendly and welcoming of local talent. I am honored to be part of this community and exhibiting at Creative Coworking. Do you have any upcoming exhibitions/plans/projects? I would love to exhibit in a traditional or alternative health care center. Viewers have observed that my work has a calming and meditative quality. Are there particular motifs/themes/symbols that you are fond of using in your work? I am drawn to curvilinear forms found in nature. These can be seashells/waves, botanical forms or clouds. I often add a patterning motif to create movement and visual excitement. View the entire interview here. I am always searching for the unifying patterns in nature, whether it is the spiraling design of a seashell, the petals of a flower or magnificent formations of clouds. As an artist, I take joy in these visual treasures. 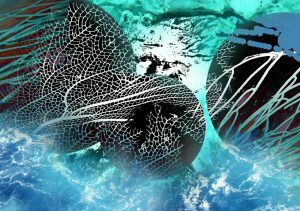 In my art prints, I interpret the rhythms, colors and patterns in nature. I incorporate and organize these elements in pleasing, yet surprising ways. 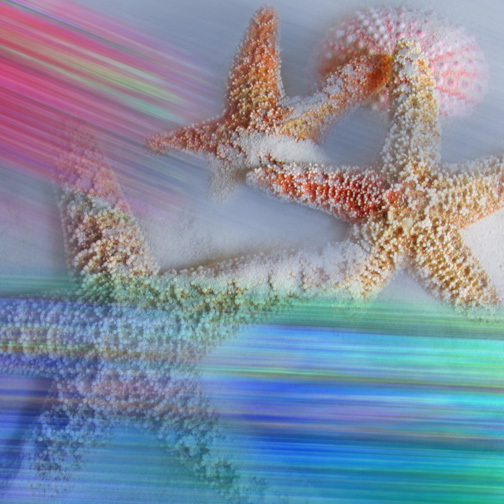 In my art print below, one can observe a galaxy of pattern on three starfish. 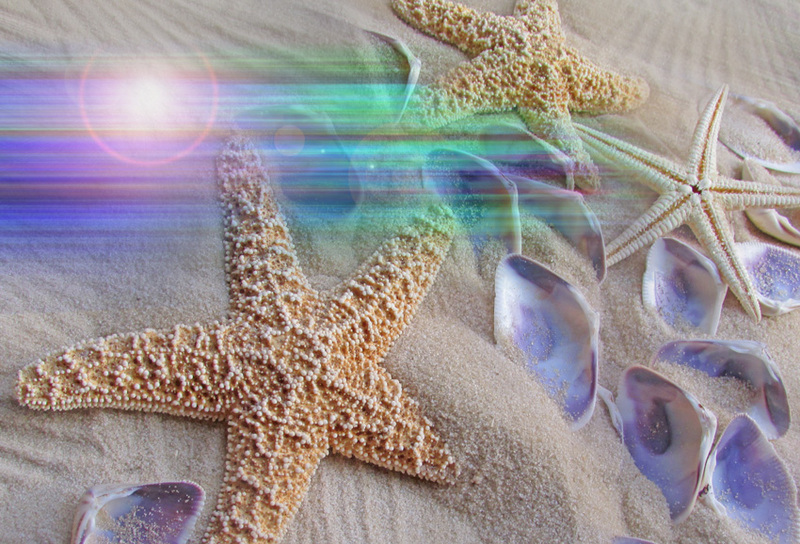 They are nestled on an imagined beach among naturally purple seashells. In this invented world, bright colors, drawn from my acrylic painting, and resembling the northern lights, blend with these sea creatures. 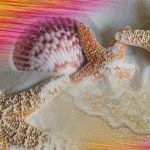 I have asked myself, why do I consistently use the rounded shapes of natural forms such as seashells and flowers as subject matter for my digital collages? In addition, I wonder why I am attracted to nature’s patterns in clouds and waves on water. I have concluded that not only is this subject matter beautiful, but it is calming and gives me peace. Of course, as an artist, I also seek an original perspective through color, line and form. Perhaps for me, combining both the meditative and the novel is the key to my motivation.